My exercise ‘Jody, Donna, Four Brothers and Koko’ is the second in a series of exercises including licks from ‘Donna Lee’ (the first, ‘Midnight Donna and Reets in Paris’ is in an earlier post.) Besides ‘Donna Lee’, other sources I used for this exercise include Horace Silver’s The Jody Grind, Jimmy Giuffre’s Four Brothers, and Charlie Parker’s ‘Koko’ (one of his solos on the changes to ‘Cherokee’.) My intent is to show how the voicings for dominant chords most commonly used by jazz pianists – i.e. those built ‘off the third’ or ‘off the seventh’ – are equally useful as both melodic fragments and as harmonic structures. The exercise uses a harmonic rhythm of one chord per bar, as in the first two bars of ‘jazz blues‘ progressions such as ‘Billie’s Bounce‘ and ‘Tenor Madness’. I would then suggest practicing the rootless voicings doubled in both hands (i.e. LH plays treble clef voicings from p. 87 while RH doubles an octave above.) Once you can play doubled voicings at a moderate, steady tempo, you should be ready to move on to the ‘parallel patterns‘ exercise, where the RH plays patterns derived from the voicings that the LH is playing simultaneously. Below the parallel patterns exercises I have shown the ways that the two patterns can be combined contrapuntally. Below the exercise are some reflections on the circle of descending fifths, both in music history as a whole and in jazz tunes. When the first keyboard instruments with a twelve-note chromatic scale were introduced around the beginning of the 14th century, they entered a world where years had twelve months and days were measured with a twelve-hour clock. In addition to the number twelve being an important unit of measurement in this era, it also figured prominently in two major wisdom traditions: the Christian tradition, founded on the Gospels and their stories of Jesus’ twelve apostles, and the Zodiac signs, which divide the year up into twelve periods, each named after a different animal or mythical figure and each aligned with a constellation of stars or a planetary movement. The recurrence of the number twelve in so many foundations of Western culture (including the twelve-bar blues) suggests that while it may occur naturally in some kinds of measurements, scientific, artistic and religious thinkers have also deliberately or subconsciously chosen it in some cases for its association with beauty, symmetry, and truth. I believe an association between twelve and the pursuit of harmonic symmetry can be heard in C.P.E. Bach’s Solfeggietto, composed at a time in the 18th century when a debate was still raging between different approaches to tuning keyboard instruments. The approaches to tuning that were prevalent at the time (such as ‘mean-tone temperament’) rendered some intervals and key signatures more consonant and others more dissonant, while a newer approach called ‘equal temperament’ allowed composers greater freedom to modulate through multiple keys within a single piece. In Temperament: How Music Became a Battleground For the Great Minds of Western Civilization, Stuart Isacoff writes that C.P.E. Bach ‘wanted equal temperament but was confused about how to get it.’ The conclusion of Solfeggietto uses all twelve tones of the chromatic scale in the space of four measures, through a progression of five dominant seventh chords sequenced through the circle of descending fifths followed by a diminished seventh chord. This passage, which may have tested the limits of a tuning where not all major keys were equally consonant, suggests that Bach’s interest in equal temperament may have been related to an interest in using wide-ranging modulations in his compositions. C.P.E. Bach’s progressions and melodic shapes, and their relationship to the pop song structures on which bop players based their improvisations and compositions, caught the ear of Bud Powell, who made ‘Solfeggietto‘ the introduction to his remarkable hybrid piece Bud on Bach. The dominant cycle can also be heard in the Mazurka in G Minor Op. 67, No. 2 by Chopin. Among the bop players who used Chopin’s melodic ideas in their improvising was Charlie Parker, whose use of the Military Polonaise and the Minute Waltz is documented on a fascinating webpage devoted to Bird’s use of quotes. In many jazz standards from the swing and bop eras, dominant seventh chords moving through the circle of fifths are used in extended harmonic rhythms. The bridges of ‘Stompin’ At the Savoy’ and ‘I Got Rhythm’ move through a four-chord sequence along the circle of fifths, spending two measures on each chord. and the first half of the progression in ‘Sweet Georgia Brown’ moves through a three-chord sequence in the dominant cycle, spending four measures on each chord before resolving to the I chord. 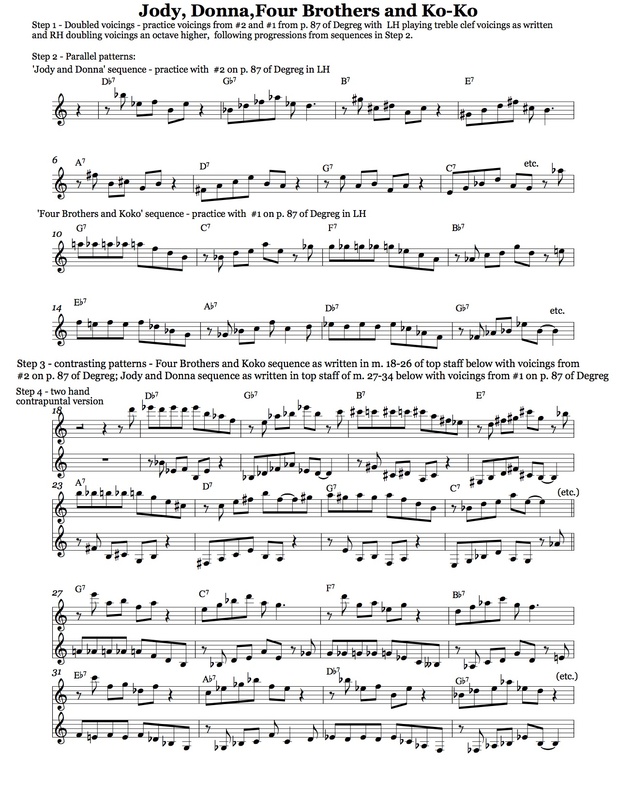 In addition to being often-played jazz standards, the chord progressions of these tunes have been used as the basis for many jazz compositions: Charlie Parker based his ‘Relaxin’ With Lee’ on ‘Stompin’, and was one of many jazz players to base multiple tunes, including his ‘Anthropology (a.k.a. Thrivin’ On A Riff)’ on the chord progression from ‘I Got Rhythm’. Monk’s ‘Bright Mississippi’, J.J. Johnson’s ‘Teapot’ and Jackie McLean’s ‘Dig’ are based on ‘Sweet Georgia Brown’. In contrast to the relatively expansive use that Tin Pan Alley and swing-era composers made of the dominant cycle, composers in the bop era and afterwards used dominant cycles with a more accelerated harmonic rhythm (two beats per change) to reharmonize standard progressions; Thelonious Monk’s ‘Humph’ is a dominant cycle reharmonization of ‘I Got Rhythm’; and the heads of Barry Harris’ ‘Save Some For Later’ and Benny Golson’s ‘Blues March’ use the dominant cycle to reharmonize different phrases of the twelve bar blues progression. Monk’s tune ‘Skippy‘ is based on his dominant cycle reharmonization of ‘Tea for Two’ (although the ‘Tea for Two’ reharm was not recorded until a number of years after ‘Skippy’). As always, I welcome all kinds of comments on this blog entry, but I would be particularly interested in hearing about other culturally significant uses of the number twelve, or in other examples of pieces that include dominant-cycle modulation. I encourage musicians reading this to try composing a twelve-bar blues melody following the Barry Harris scale outline discussed in an earlier post and incorporating some of the dominant seventh chord patterns from this post. Acknowledgements: Thanks to friend and piano tuner Justin Rose for the suggestion of Temperament, to Will Burhans for introducing me to ‘Like A Mighty Rose’, to Bruce Sklar for assigning me ‘Donna Lee’ many years ago in a lesson, and to Tom McClung for introducing me to ‘Skippy‘ and its relationship to ‘Tea for Two’. well its all fascinating. A few thoughts..12 of course is the number of moon cycles in a year- sort of. Compromise already in the human psyche around that issue if you think about the history of calendars- so if that was one’s guiding principle , certainly the scale tunings would have seemed fair game for experiment.At some point, the primacy of 12 must have become a central musical issue, not attached to astrological dogma, i assume.The system is workable, certainly one can stretch the V- I relationship a few beats per second, must have been seen as a compromise with “perfect’ tuning systems. But what gets me is the more basic question- as there are other systems on planet earth aside from our 12 tone western harmonic practice-why on earth should the overtone series which as humans we perceive as octave fifth and so on , be based on integer relationships? Any anthropologists want to chime in here? The ubiquity of 12 in Western culture probably has much to do with the fact that, prior to Napoleon, Europe as well as most of the rest of the world used a base-12 number system. Besides the examples Tom mentions, there are remnants in English measures, for example 12 troy ounces in a troy pound; twelve inches in a foot; and 12 old pence in a shilling. Of course, eggs and donuts are still sold by the dozen and some merchandise is still sold by the gross. Base 12 also seems to be reflected in the use of degrees for a circle and seconds in a minute. The historical popularity of base 12 is that you can use it to count on your fingers to 60 (or even 72), rather than just ten. In your right hand, your thumb can count to 12 by pointing to finger tips and finger joints to reach 12, and your left hand can indicate up to five 12’s. Apparently, this method of counting is still used in parts of Asia, and it is also reflected in Tolkien’s Elvish languages (rastanotie for “dozen counting”). Another advantage of 12 compared to 10 is that it is divisible by both 4 and 3, so you can indicate a third or a fourth by a whole number rather than a number and a fraction (or percentage) as in base 10 (3 1/3 and 2 1/2), making it handy for every day use. For the ultimate nerd experience, you could consider joining the Dozenal Society of America, which advocates the re-adoption of the base 12 system. Musically, if you divide a string into 12 parts you can easily get a fifth by playing a 2/3 of its length (8/12) and a fourth at 3/4 (9/12). Would not be so easy if the string were divided into tenths. On the other hand, playing a third (4/5th of the string) is problematic. Letting you know I read this and testing if this comment will post. Going to try the Barry Harris outline as well as the patterns. Unfortunately nothing’s coming to me about the number 12 or tunes including the dominant cycle currently but I’ll post another comment if I think of anything.